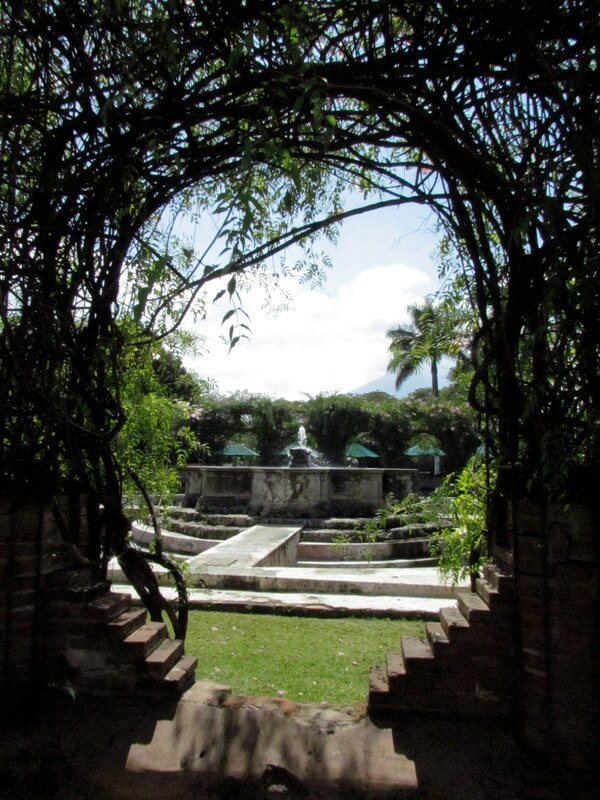 Casa Santo Domingo is a grand hotel with beautiful gardens, pocket museos, workshops and quiet corners of beauty. The hotel is 25 years old. 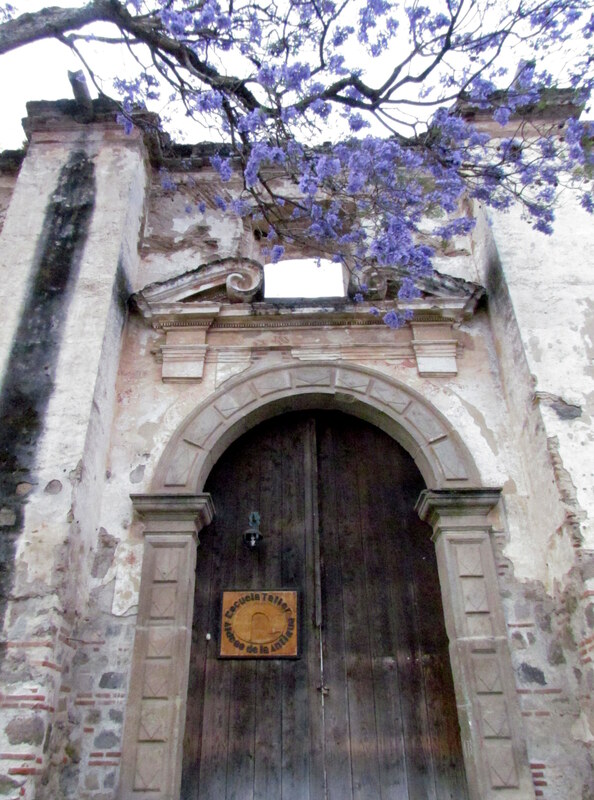 The ruins that it has absorbed into its structures was built in 1538 as a convent, or monastery, depending on how you interpret the two words. 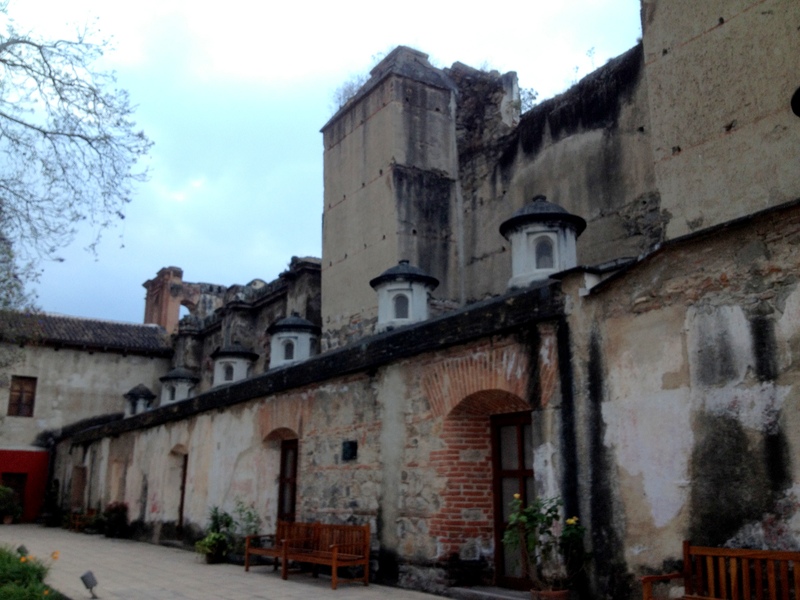 It’s surprising to me that so much of the convent survived as the quake started in July and aftershocks continued until December! 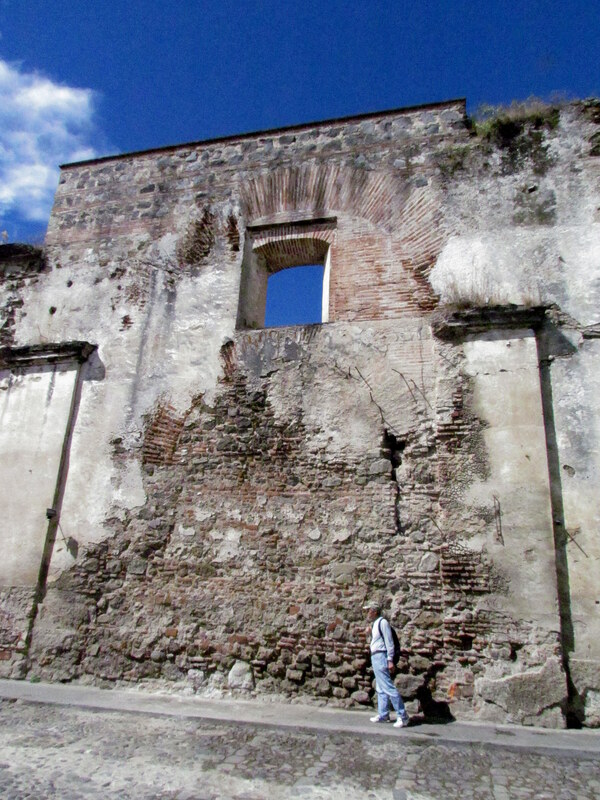 The convent came crashing down during the 1773 Santa Marta earthquake. The quake was so named as it started on the day designated to honor Saint Martha. 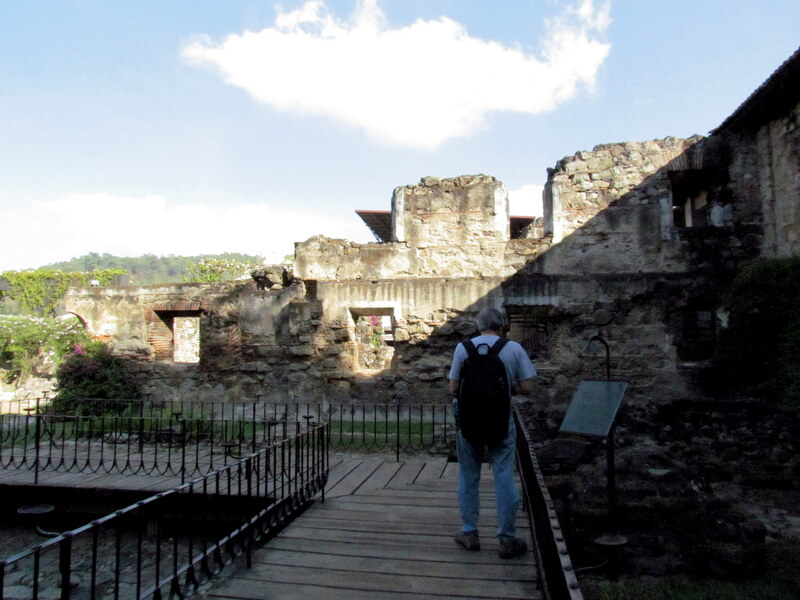 We stroll the grounds, admiring so many amazing views of the ruins. 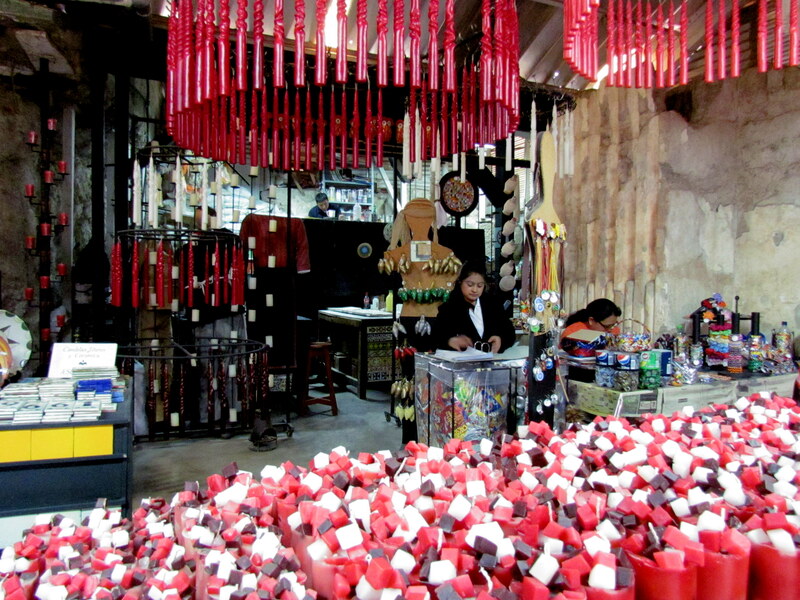 The candle workshop offers candlemaking classes! 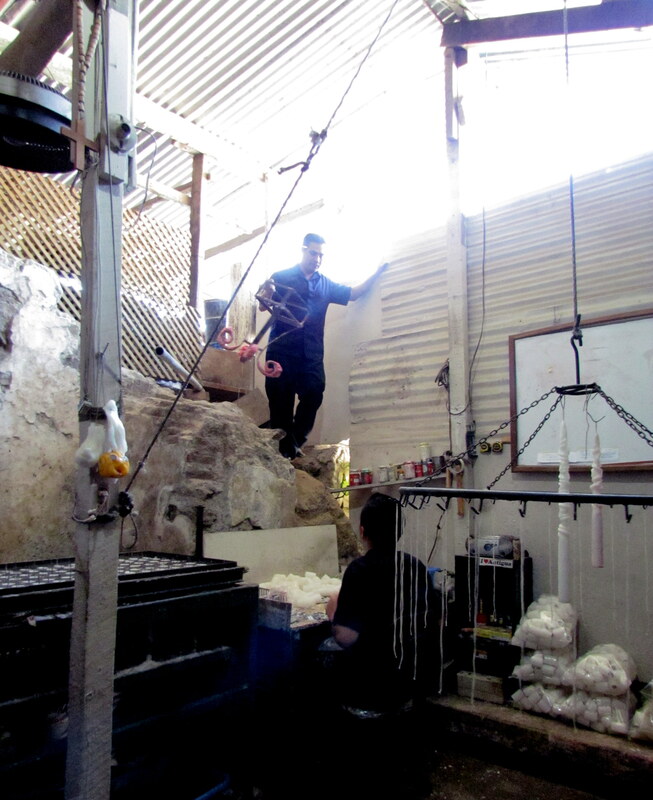 A worker climbs down from the supply area in the back of the candle shop. 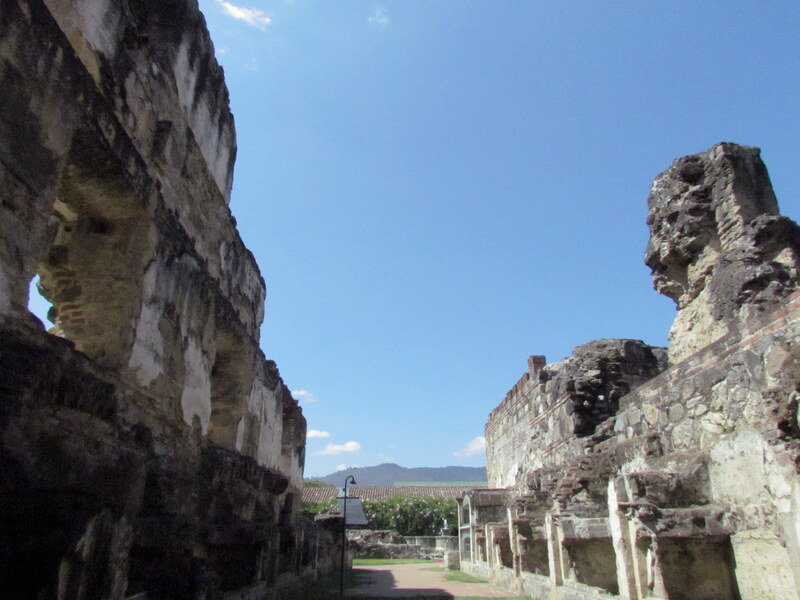 I believe that is part of the ruins jutting out! 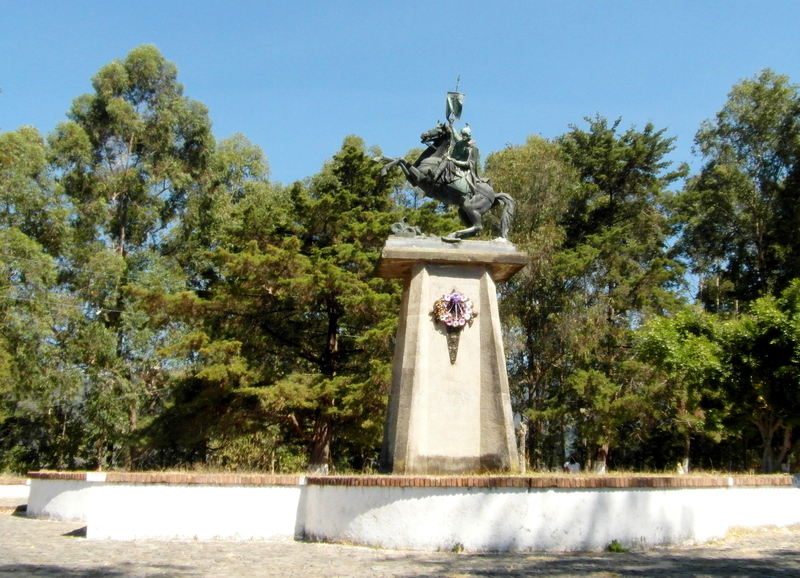 Many Latin American cities have religious statues, such as crosses, overlooking them. 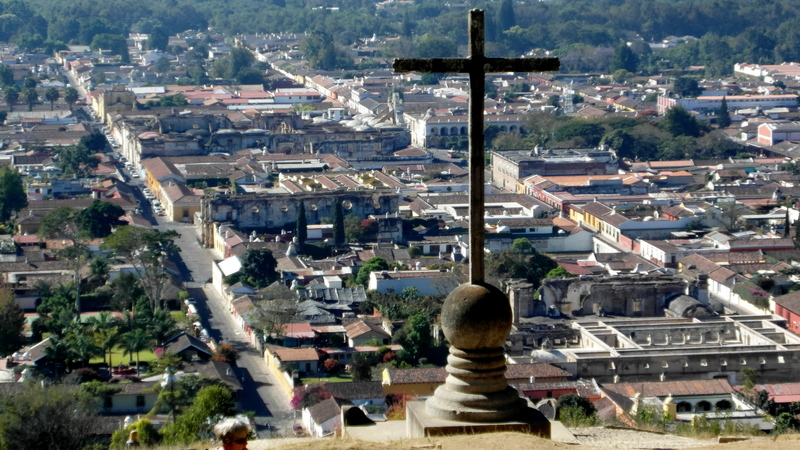 Antigua’s stone cross is a symbol of its strong faith in God’s love. 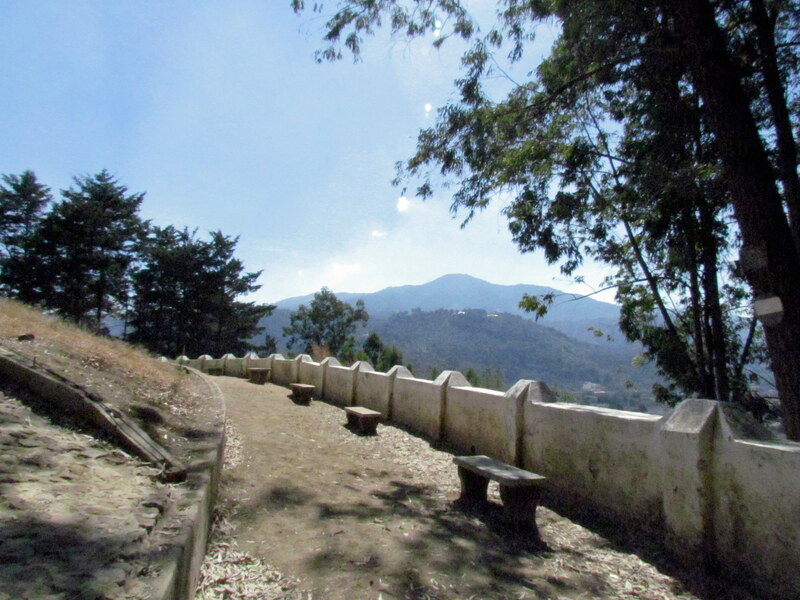 We take a tuk-tuk up to Cerro de la Cruz, Hill of the Cross, and pay a small admission price. 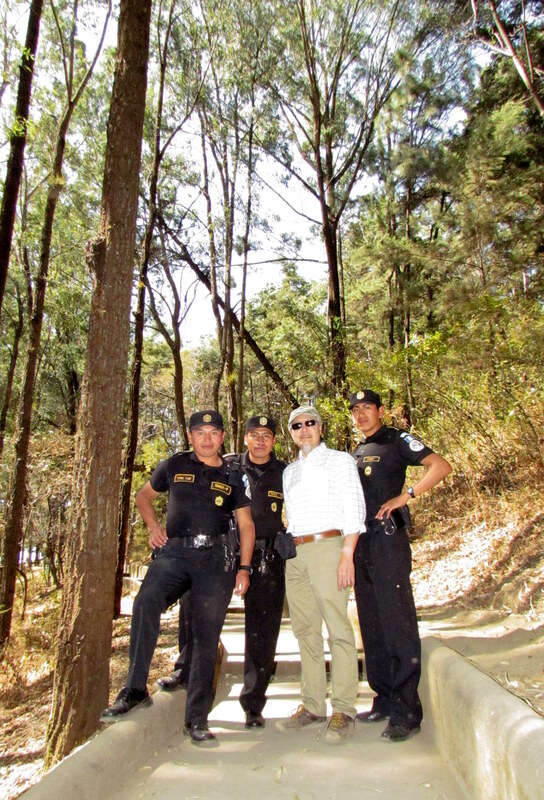 The tourist police are visible and we feel safe. A local warned that if there were no police, DO NOT STAY, not even in daytime! We are blessed with a decent view of the city and surrounding area. So glad to see the tourist police on the job! We strike up conversations with visitors to the park. We ask so many questions that someone wants to know if we’re thinking of moving here. One local tells how she’s from the states, but married a Guatemalan. He works, but his salary is not large, so they live simply. They’d love to live in the states, but wouldn’t be able to make it with her pension. Another, a Canadian ex-pat who married a Guatemalan, is thriving! He’s a business owner and his wife also has her own business. He wouldn’t live anywhere else. They own several houses and their child attends private school. 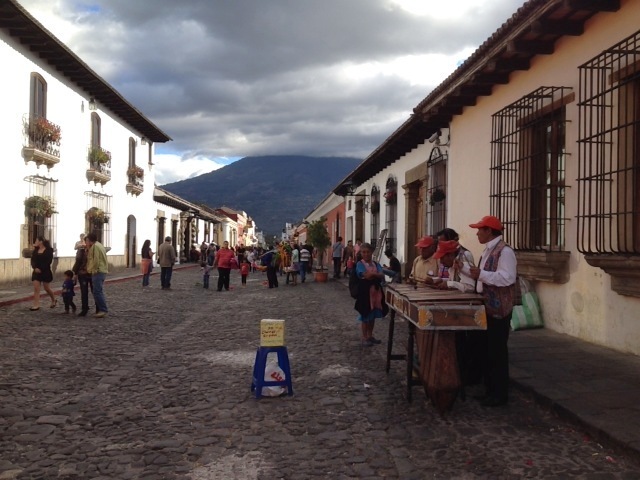 So many with money are living in La Antigua that the locals are being slowly squeezed out. It takes about 10 minutes to get down the paved concrete walkway that ends near 1st Avenue. Lunch at Tipical Antiguenos Restaurante is alright, but salty. We’ve been told Maya didn’t have salt or sugar before the Spaniards came, but now they use both liberally! The restaurant is also very typical of some of the rural eateries in that I have to scoop water out of a barrel to flush the toilet. Interesting ingredients can go into chocolate! 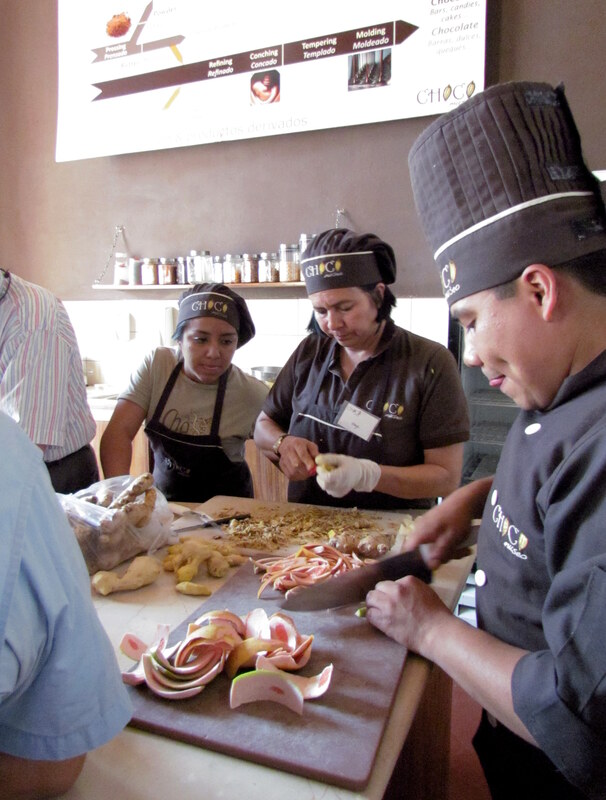 Choco Museo gives a history of the cacao bean, holds chocolate making classes, offers free chocolate tastings and chocolate tea! 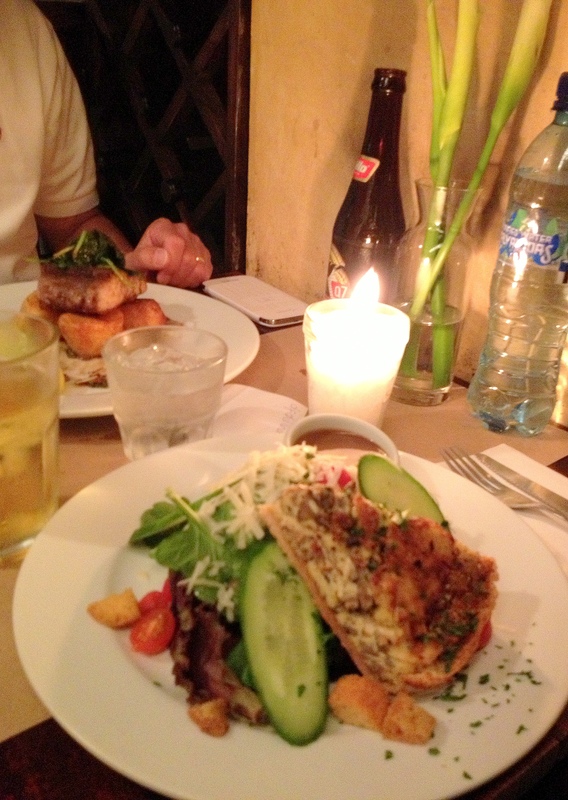 Dinner at Hector’s, listed as the #2 best restaurant in La Antigua. Seats about 25 and has only one overworked waitress tonight. The food is wonderful, but there’s something wrong about the practice of an automatic tip added to the bill when the service is lacking. So exciting! 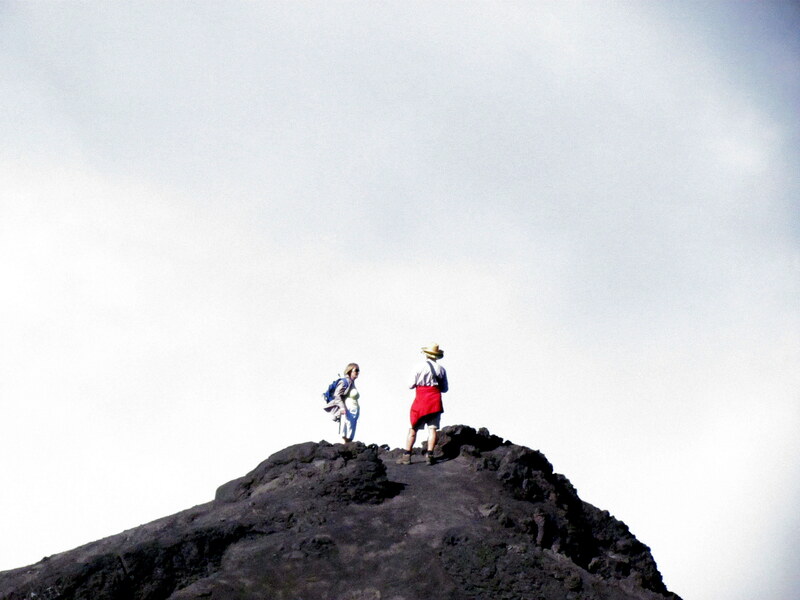 Today, we go up Volcan Pacaya. It erupted the week before we came and flights were cancelled. Thank God, everything settled down and we had no problem flying in. 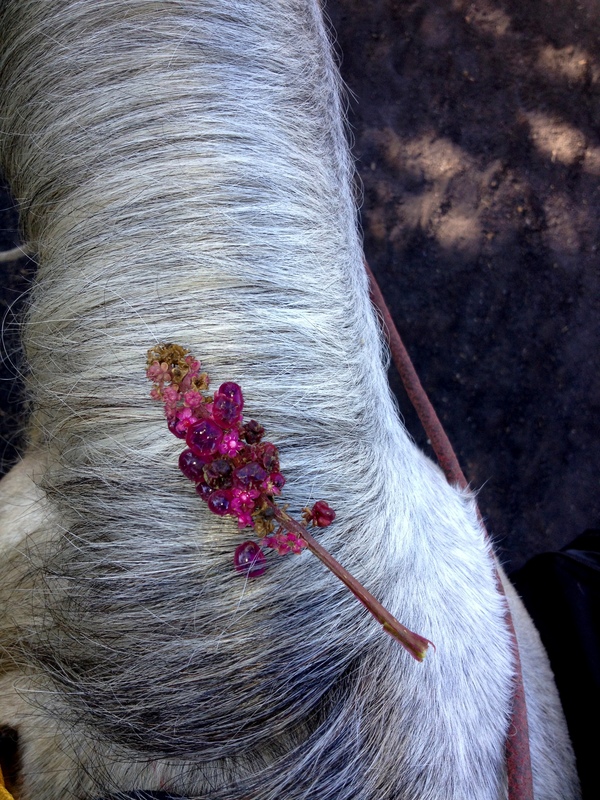 I start wheezing as we begin the 1 1/2 hour ascent, so I get a horse for Q100 ($12.50). A group member calls me, “Princess” as I’m the only one riding. I tell Two-Hats Tom to leave me alone, I’m still on meds for an upper respiratory infection! My horse, Valente, brings up the rear of the tour. 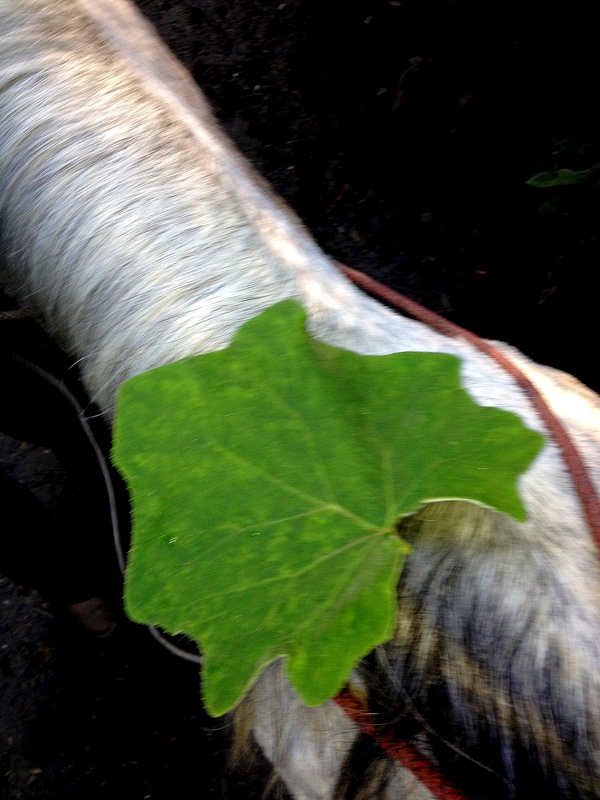 His handler stops often along the trail to break off a leaf here, a bloom there, and explains how locals gather resources from the forest. 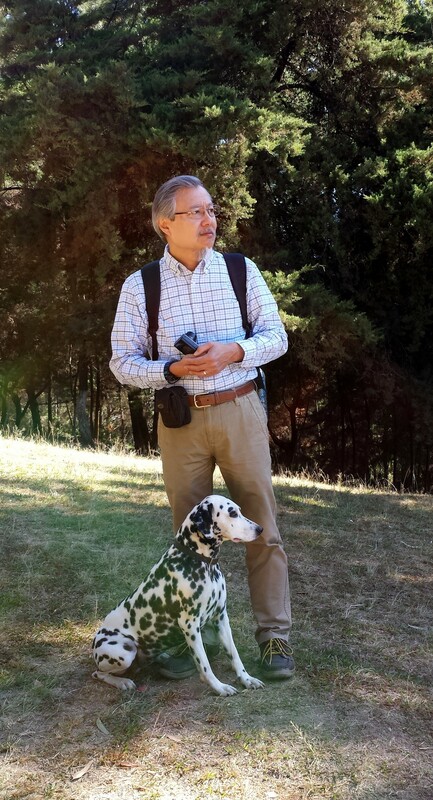 His English is better than the park assigned guide’s. This leaf’s underside is velvety soft. It can be used in cheese quesadillas or as emergency toilet tissue! I think I was told that these berries, when mature, are used in clothing dyes. A safe distance from the main cone of Volcan Pacaya. There’s a constant vapor cloud. We’re not allowed to climb up to the rim, though I’ve seen pictures of people near its lava flows. Jadwiga and Two-Hats Tom have a great view! 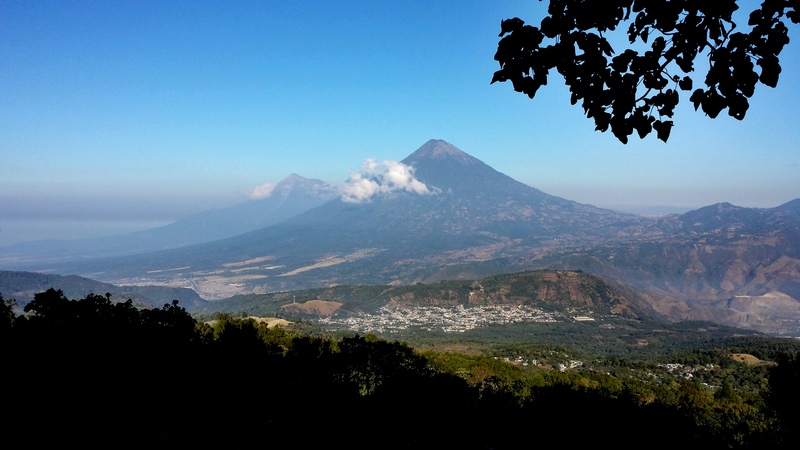 Recent eruptions give locals concern as Pacaya sits on a magma chamber, making it very unstable. It produces hundreds of explosions each day, causing more lava to flow down. The views are wonderful. 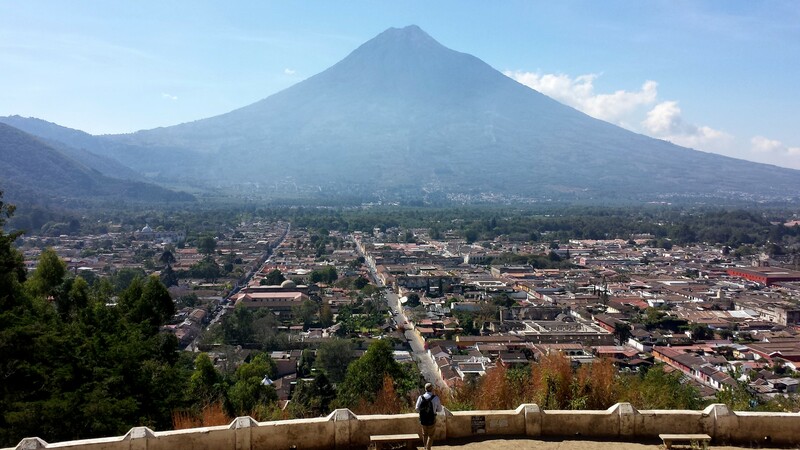 We can even see Guatemala City! A 1961 eruption was unexpected and lasted almost a month! 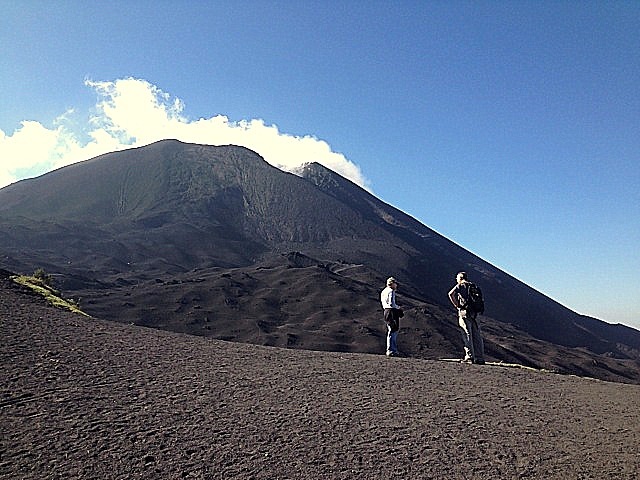 In 1962, a collapse near the volcan’s summit, possibly caused by a volcanic vent, resulted in a pit crater. Pacaya’s 2010 eruption was so powerful that it caused the main cone to collapse. 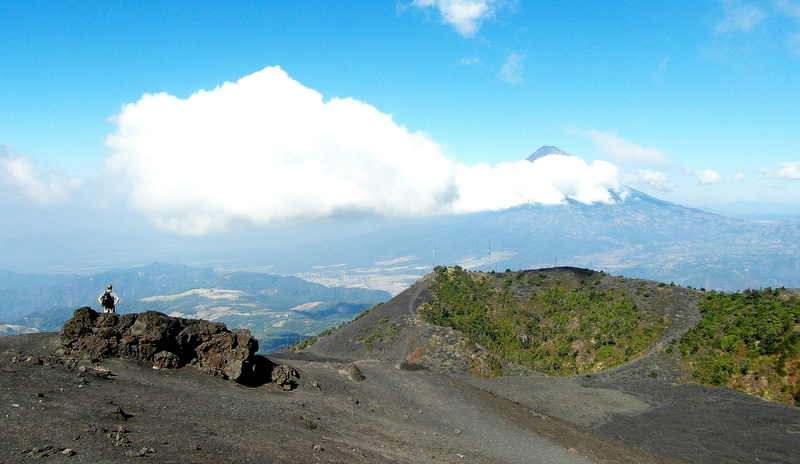 The volcan is listed at 8,373 ft., but I don’t know if it was re-calculated after that event. More Pacaya information can be seen at: www.volcanodiscovery.com/pacaya.html ‎, en.wikipedia.org/wiki/Pacaya ‎ and volcano.oregonstate.edu/pacaya ‎. 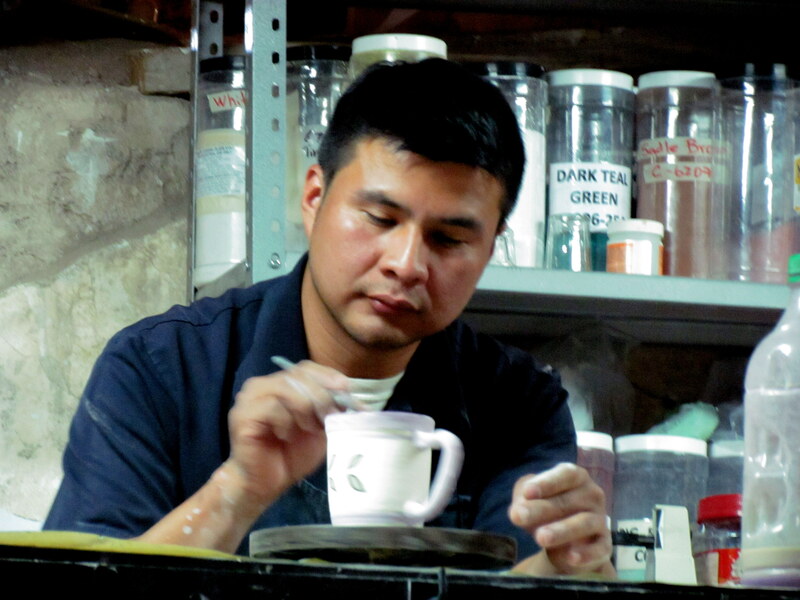 In the afternoon, we take a slow tour at a local cafe finca (coffee farm). 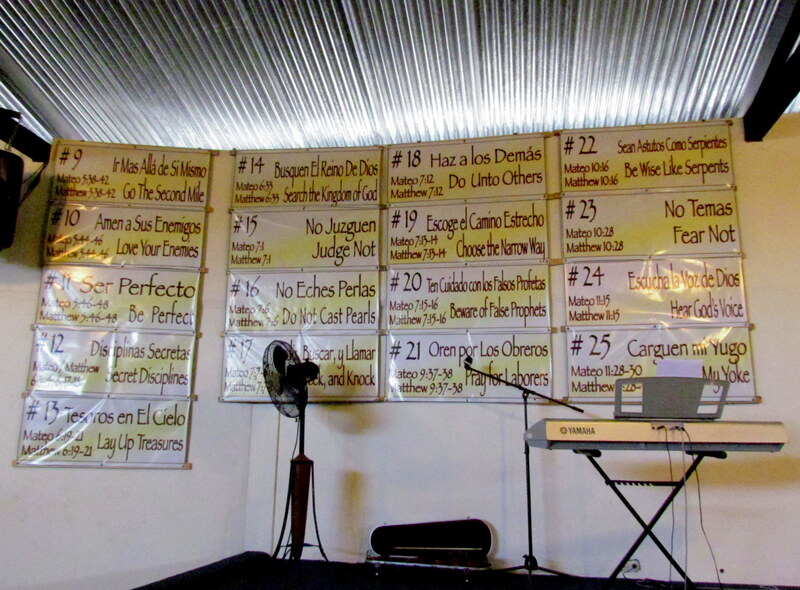 We attend Iglesia Del Camino, the only Spanish to English speaking church in town. It’s 10 years old and makes a “joyful noise unto the Lord!” Ah-h-h, my soul is revived! After service, we lunch across the street. 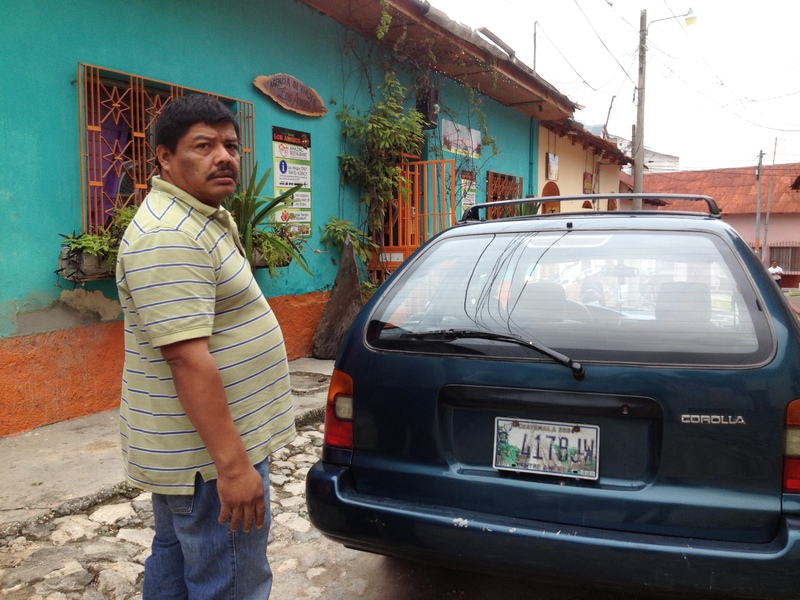 We see the other Iglesia Del Camino visitor from today’s service. I go out and ask if he’d like to join us and he does! James says he came in last week to teach at a local English school. He’s also from the states. 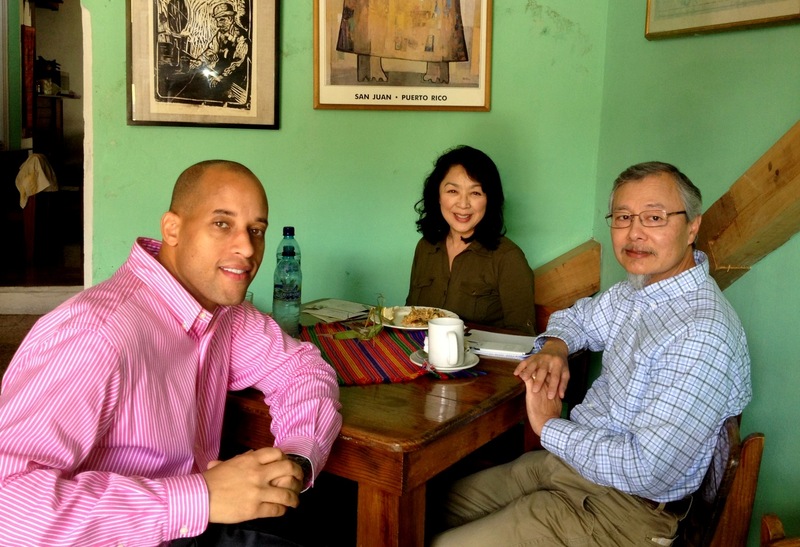 Less than a year ago, he quit a corporate job, took Spanish and TESOL (Teachers of English to Speakers of Other Languages) classes and applied to teaching positions in Central America. He’s now living his dream! How wonderful that these purple blossoms come out in time for Easter! 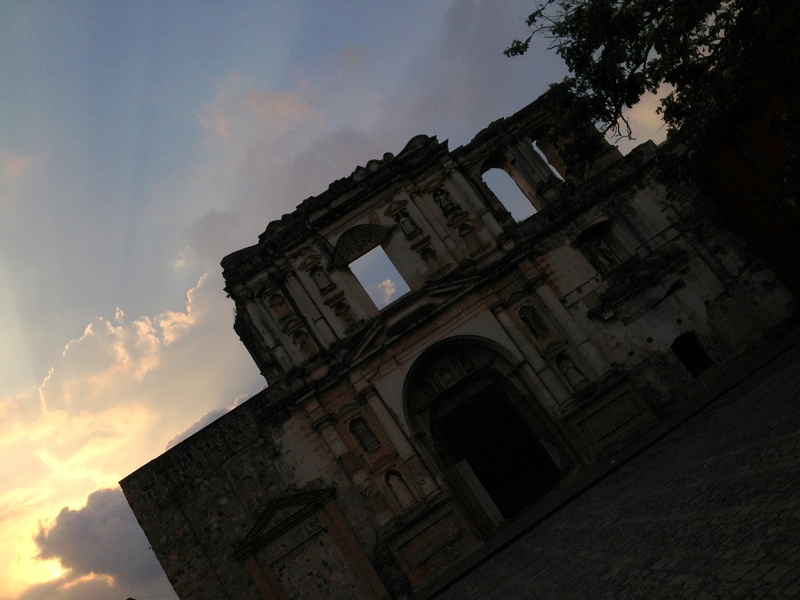 Evening in Antigua is beautiful. Proverbs 25:5 As cold waters to a thirsty soul, so is good news from a far country. 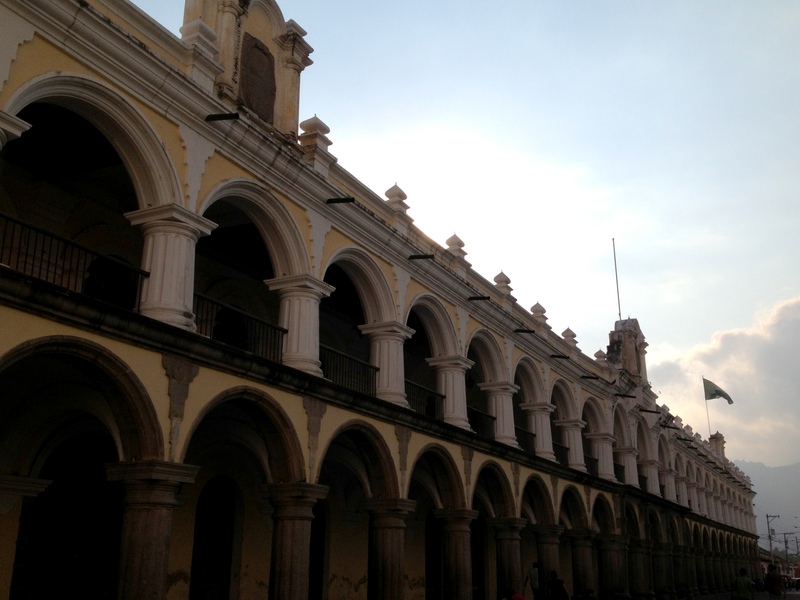 The minivan shuttle in Guat City drops everyone off in Antigua’s central plaza, Parque Centro. 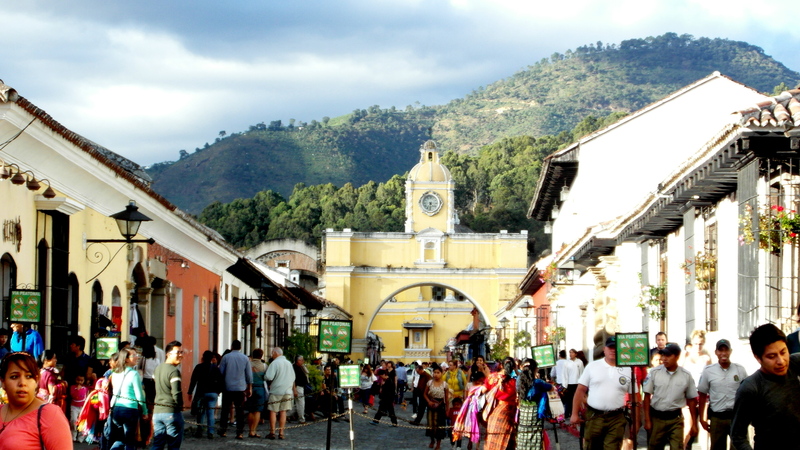 La Antigua is technically a town as there are less than 100,000 residents, but because of it’s importance in Guatemalan history, it’s considered a city. We grab a tuk-tuk to Casa Cristina. It’s an older property, pretty much like the rest of the city. Our room isn’t ready so Rosario puts us up on the more expensive second floor for a couple days at no extra charge. Nice! The room is small but quaintly furnished with lovely pieces. 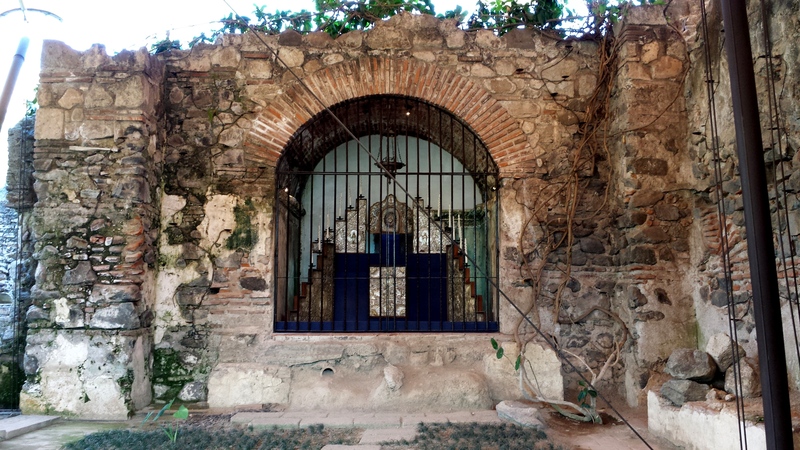 There’s complimentary coffee and sweet breads in the morning and it’s near Iglesia La Merced, an easy walk to Parque Centro. *Make friends with locals. 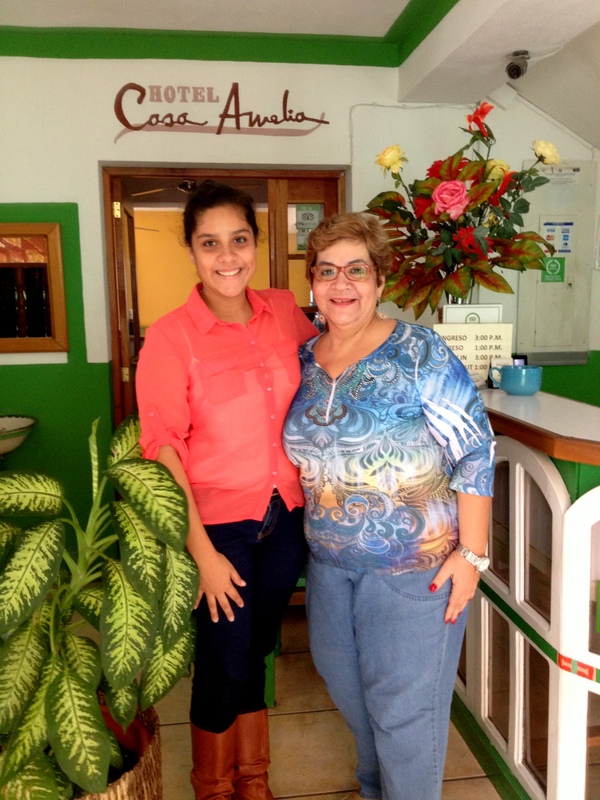 Rosario and her daughter are very helpful. They give advice on what to pay for tuk-tuks at various distances, favorite restaurants, acceptable tips to different service people, what to expect to pay and wait time at the only chiropractic clinic in town, etc. Rosario offers guidebooks and leisure reading books. 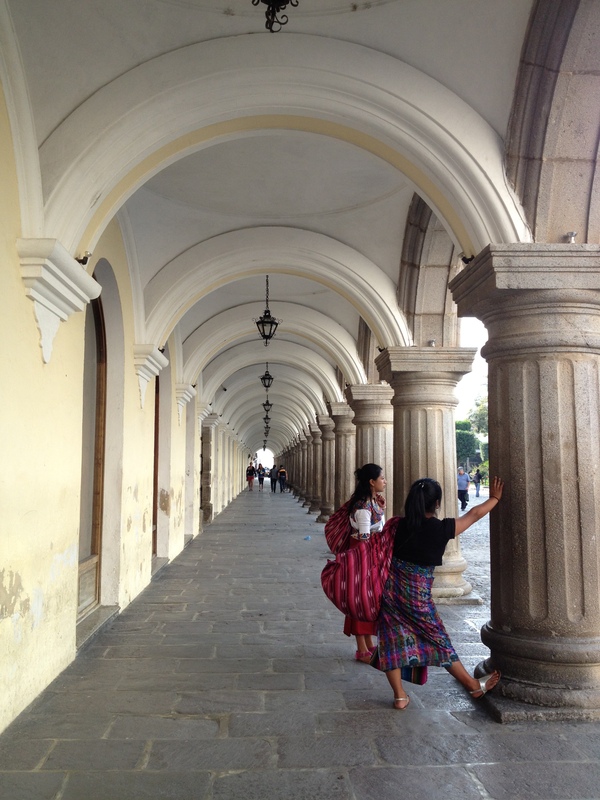 The guidebooks are a little dated, but Guatemala hasn’t changed that much. “Es muy bonita!” We walk and walk and walk. Everywhere, photographers with big cameras and even bigger zoom lenses stop and drop tripods for gorgeous views. Can you imagine how massive this ruin used to be?!? I don’t have such equipment and am happy to use what I do have. An old Canon and iPhone are my constant companions. Any direction one turns, history shines. 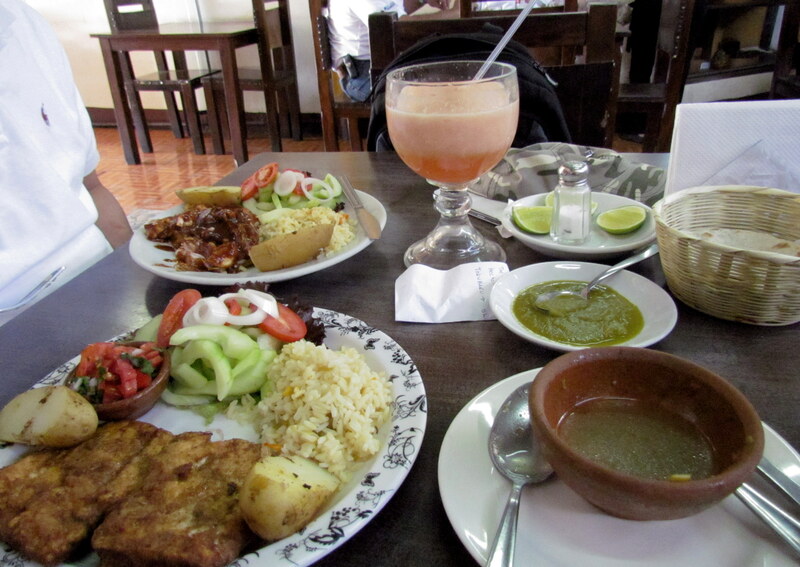 We stop at Delicias Quetzaltecas Cafe for a snack. The owner hears I have tummy problems and offers a special tea of chamomile, ginger and mint to go along with the best tasting tamal I’ve had in Guatemala. So good and of course l feel better! We take the shuttle back to Flores. It’s basically a long minivan and really kinda fun. Tourists aren’t the only riders. Locals are picked up and dropped off along the way. Friends happily greet each other, chattering and laughing easily. Beware taxi drivers that negotiate to take a group of travelers over and drop you all off at the first stop, demanding more money to take you to your hotel. The streets are cobblestone and sidewalks are uneven. 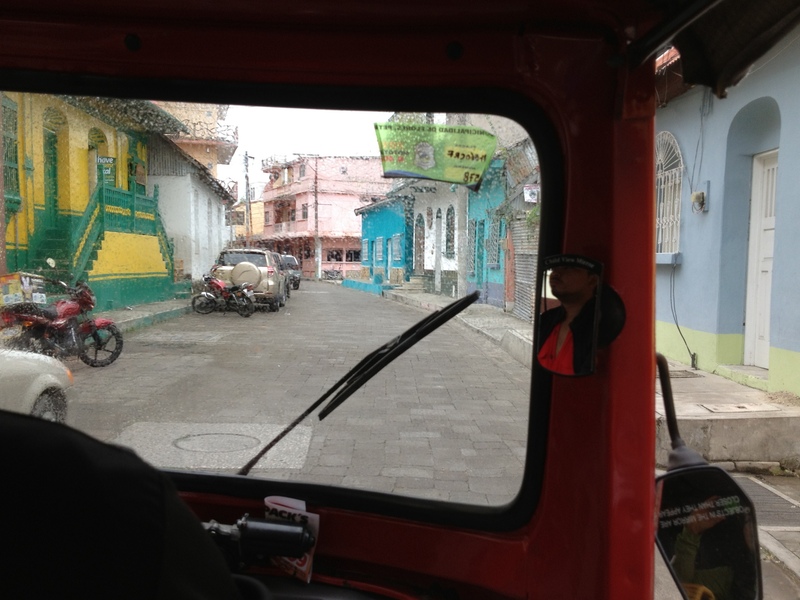 We refused and found a tuk-tuk (three-wheeled motorcycle taxi) to take us to our hotel for Q10. We had a return reservation with Casa Amelia. It’s named after Amelia and her granddaughter is named after her. There are nicer hotels, but this was affordable and convenient – it’s right by the water and near many restaurants and shops. Well, really, everything is near everything else – walking all the way around the island takes about 15 minutes! The mall across the bridge in Santa Elena has a dock at the back. 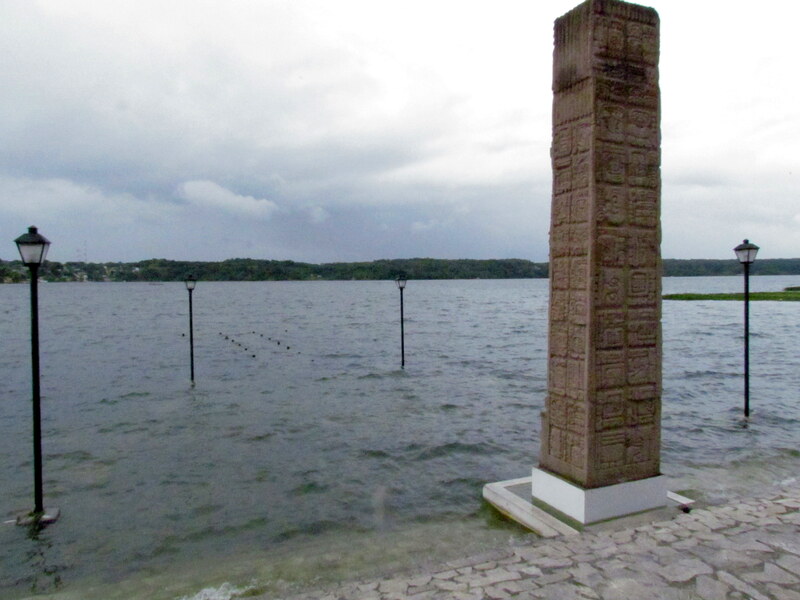 Several steps lead down to it – a dock under water. For some years now, the water in the lake is slowly rising. I wonder if this is part of a cycle. 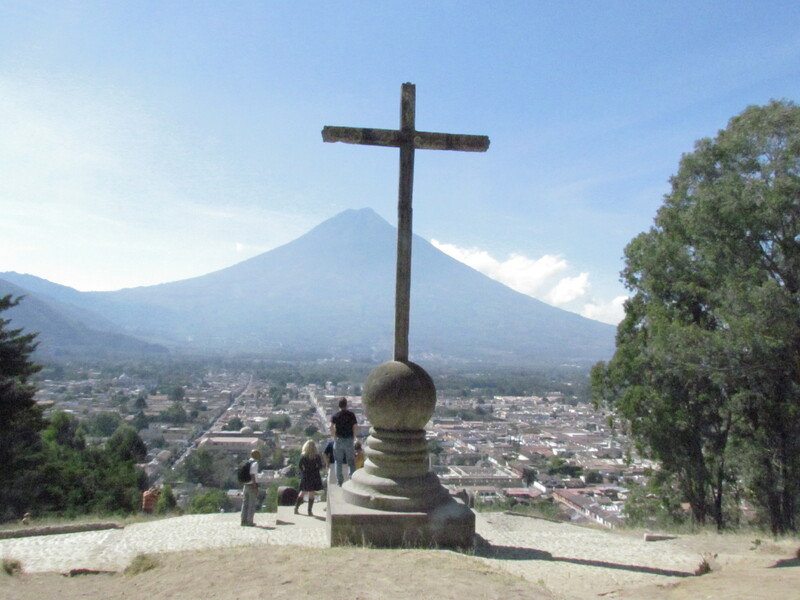 Four days ago, when we first arrived in Flores, we booked our return bus trip from Flores to Guatemala City and a shuttle on to La Antigua. 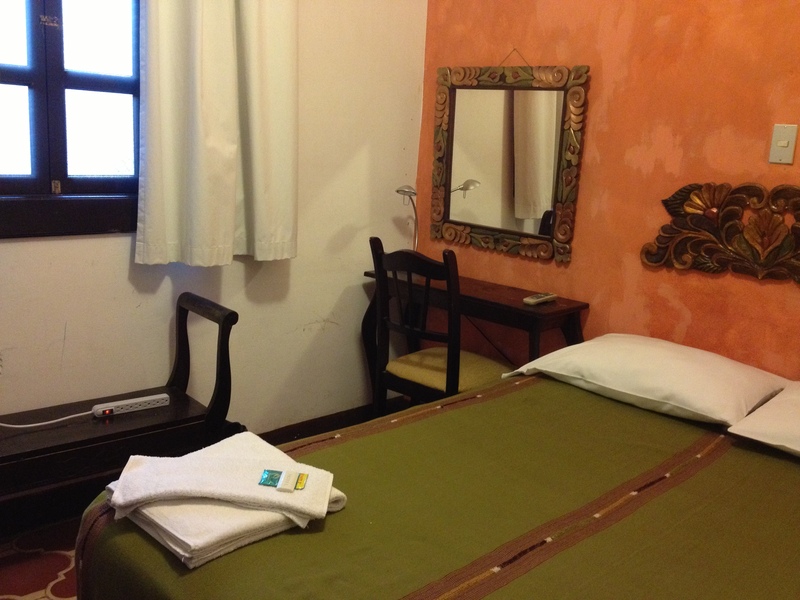 We had walked over to a local travel agency that was near the hotel and had good reviews on Tripadvisor. The owner was very pleasant and stayed open late to work with us. 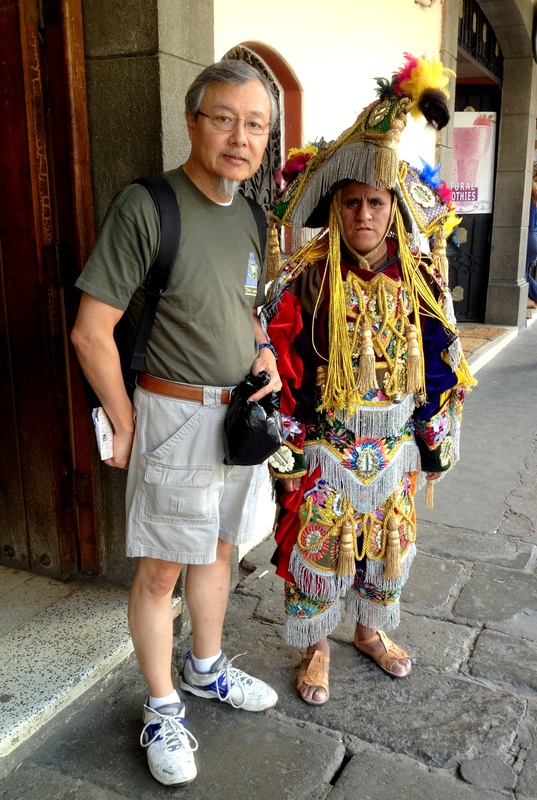 This morning, we’re chatting with another traveler. She went over to Santa Elena’s mall, found the ADN kiosk and bought a ticket for about half of what our individual tickets cost! We rush back to the travel agent and get a nice big “rebate.” I understand that businesses need to make money, but that was excessive for just making a couple of phone calls. I remember preparing for this trip and reading that travel agents provide a great service and are here to assist travelers, and contrary to popular opinion, are not here to get all they can. Maybe that’s true of the majority of agents. *This experience just reminds us to do our homework and shop around first! We’re not sleeping over. At 8pm, we board the overnight bus. Yes, the roomy seats are bigger than the average and there are footrests. No, I do not recommend the supposedly upgraded ADN. When I ask the bus driver a question, he very rudely answers with an “I-can’t-be-bothered” frown. The onboard toilet is smelly! When I have to go back to my seat to get a headlamp (to see in the dark cubicle) and husband (to hold the door with the broken lock from swinging out) and tissue, it is NOT a good trip. *There are upgraded buses. Confirm when booking that yours is indeed the executive level. The first day we’d arrived in the park, we bought tickets and went in after 2:30pm. (The sunset tour started at 3:30pm.) 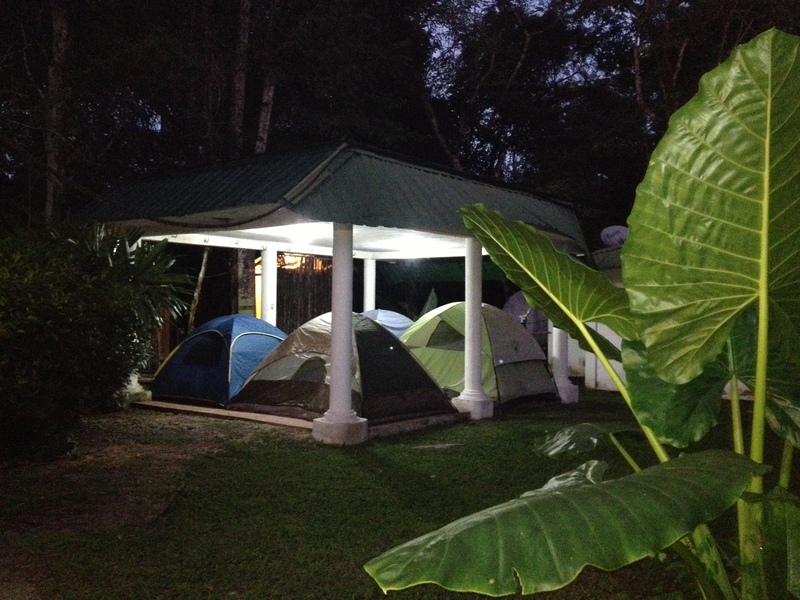 Even though tours for Tikal Inn guests are free, park entry is not. We’d read that you can get tickets and enter the park after that time and be able to use the same tickets to get into the park the next day. IF … you come in the next day during regular hours of operation, that is true. The sunrise tour starts before regular hours so we still had to buy (reduced price) tickets. 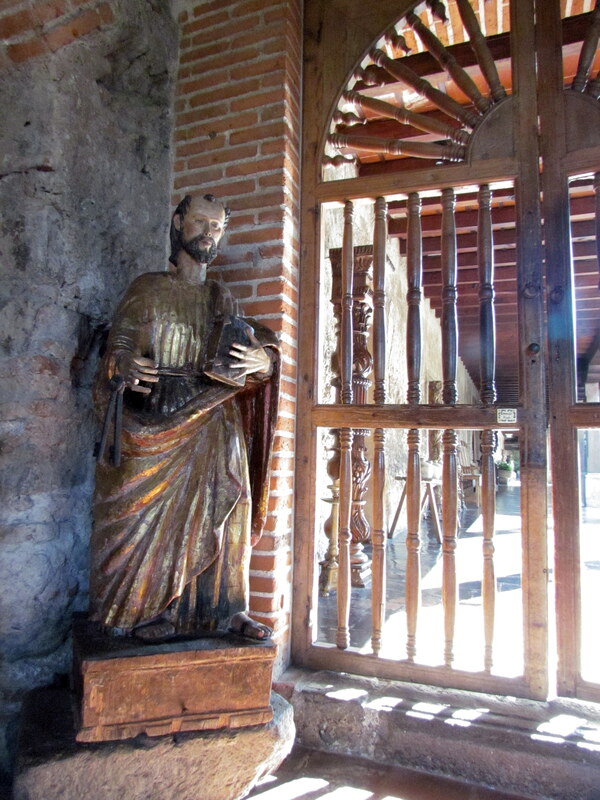 Don’t let Tikal Inn’s unappealing front entryway throw you. The overhang is sadly in need of major repair, the lobby area worn, but pass through it to see a pristine pool and beautifully maintained lawns leading to the cabins. The waitstaff is very nice, especially Oscar. Complimentary breakfasts and temple tours add value (though the guides could use more English lessons!). The room is very utilitarian and the the tub drains very slowly, but there’s a clothes rod with several shelves. Electricity only works 6am-8am and 6pm-10pm, so you’ll need to be quick about it if coming back from the sunset tour. (Yesterday, we came back by 8pm, went straight to dinner in the dining room before getting back to shower before the lights went out!) A nice touch was the complimentary 1.5 liter of water. 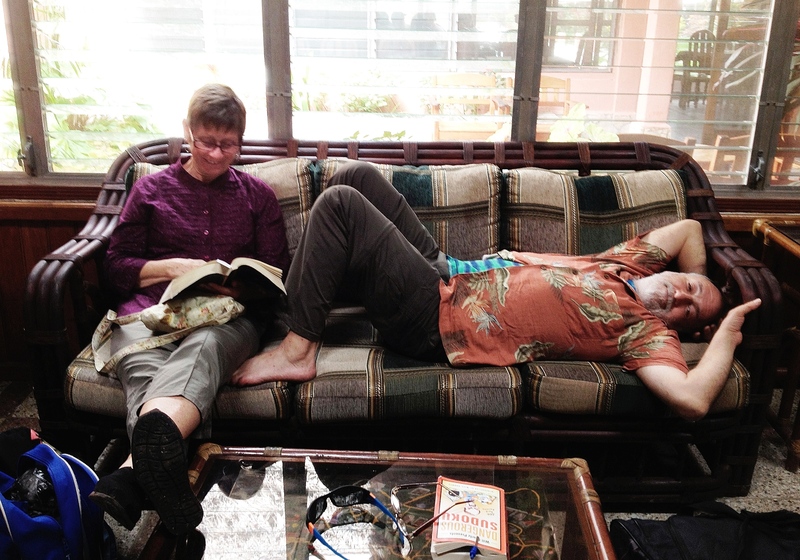 Val and Paul relaxing in the casual Tikal Inn lobby area. We made friends with Val and Paul, a Canadian couple. Today, we move over to Jaguar Inn. It is next door and even closer to the park entrance. Our room is a lovely improvement. We were greeted with a complimentary 20 oz. bottle of water. And, the lights and fan work ALL the time – YAAY! 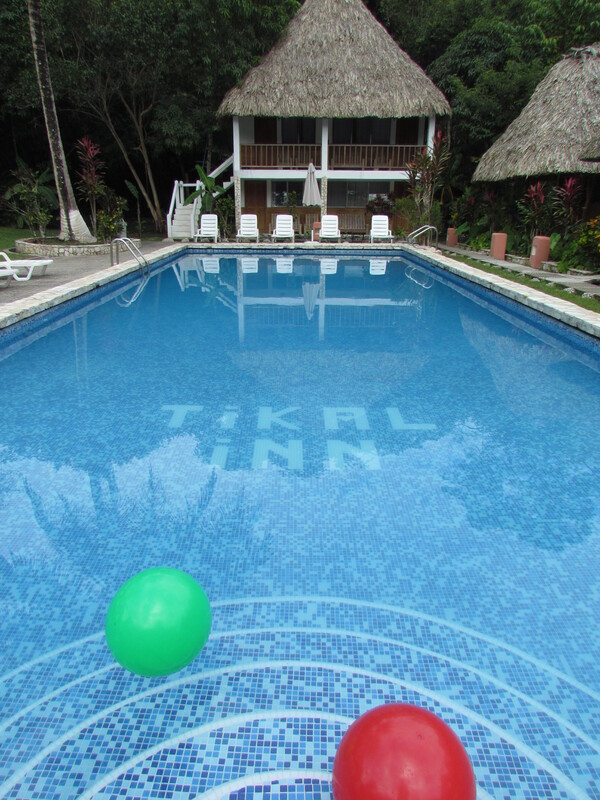 I heard the pool wasn’t up to snuff, but they have a computer for guests and the restaurant’s restrooms with outside sinks are clean and updated (unlike Tikal’s). The dining room is connected to the front desk, updated, roomy and with beautiful picture windows. 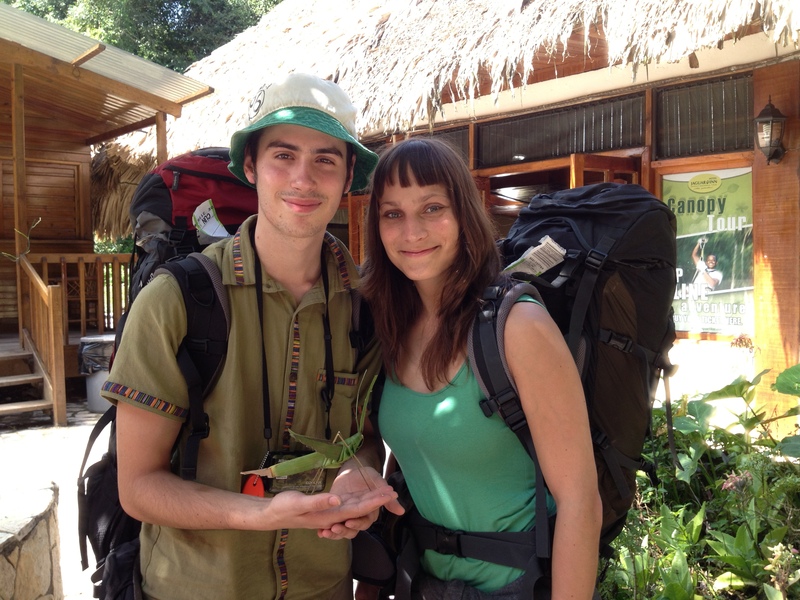 We say good-bye to Johanna and Nicholas, backpackers who sat next to me on top of Temple IV yesterday. An Equadorian friend had given them a grasshopper made from reeds. They give Equi to us because they know he would be crushed in the backpack. They’ve hitchhiked all over the world. After a short wait, a ride materializes and they’re gone! 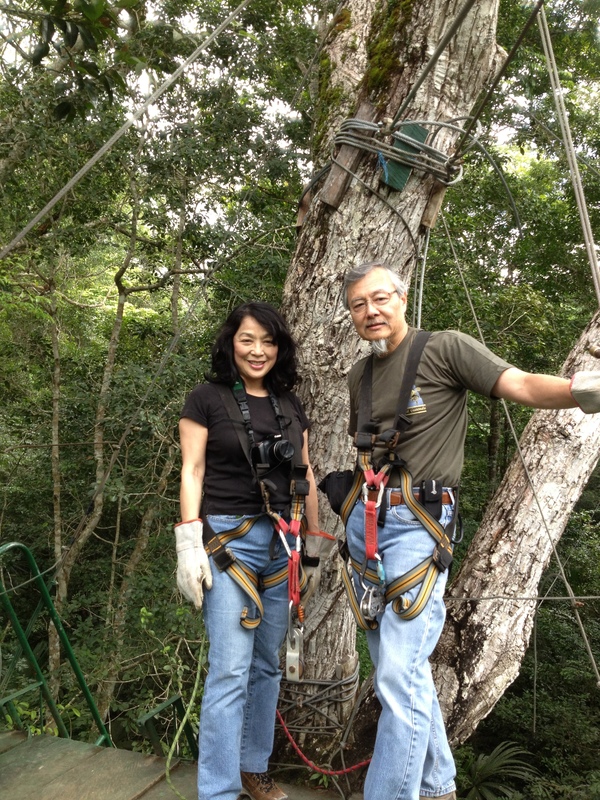 We speak to, Caesar, a U.S. raised park guide not associated with the inn who very helpfully arranges for a canopy tour driver to pick up our suitcases and drop them off at Jaguar, at no charge, before taking us to the ziplines. After a “Super” zip tour, we cross the road to lunch. 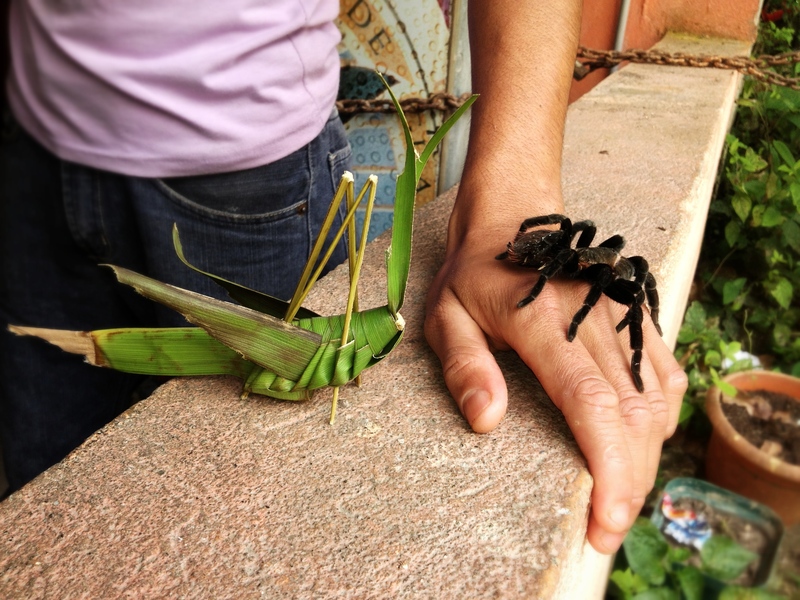 There, Equi meets a real live tarantula. 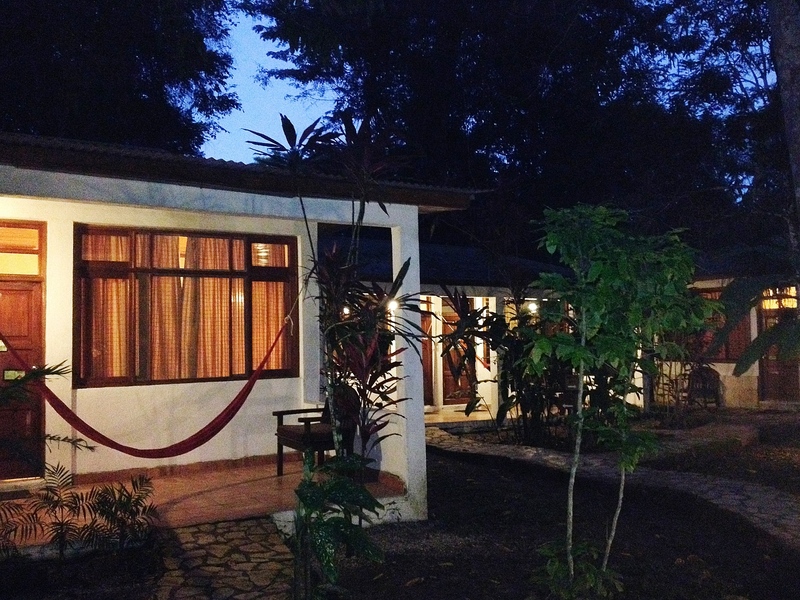 Dinner at Jungle Lodge, the first lodgings in Tikal. Archeological teams stay there as it’s closest to the park. It’s bigger, nicer and has fancier food. 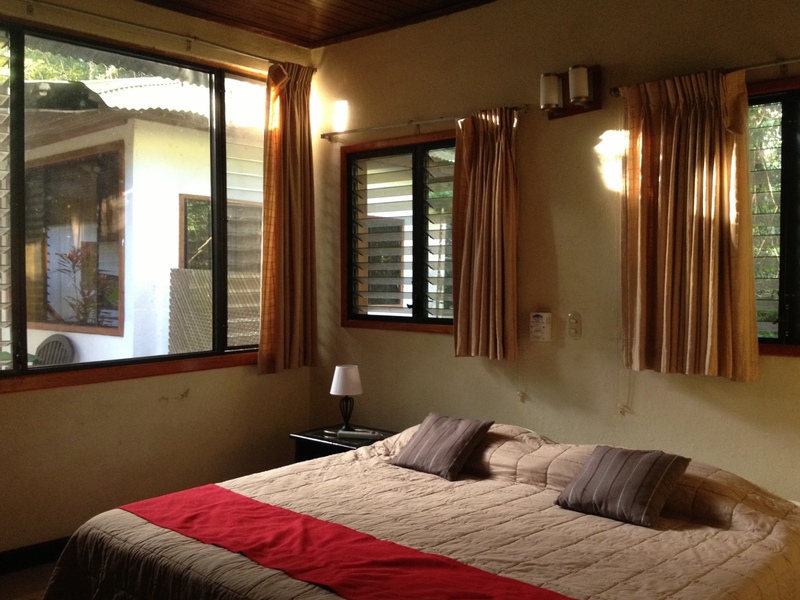 The rooms are spacious with high-beamed ceilings and mosquito nets (Tikal Inn and Jaguar Inn don’t have nets) and have full electricity 24/7. One of my favorite things to do here is digging around their ice cream case, the only one in Tikal! We walk back to Jaguar Inn, using our flashlights.